Somatic Finance® is experienced as a Path of Practice. Embodying the principles of Somatic Finance requires building muscles with practice, so that the wisdom of our body joins the wisdom of our mind. While not separate, it is only with practice that we become fully aware that our mind and body are one. It is only with practice that our body is invited to serve our mind and our mind is invited to serve our body. Five-minute try it’s are short and powerful practices on your path to financial integrity. 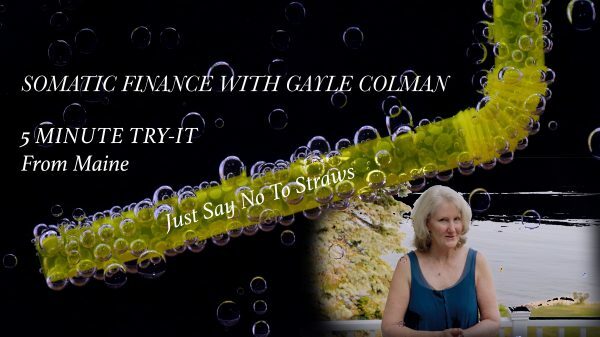 We encourage you to just try it and see how strong your Somatic Finance muscles can be! PURPOSE: To gain awareness of our planet, and in particular marine life that struggles with human plastic use. PREPARATION: Ask yourself, am I open to learning and seeing a new perspective? If so, watch my rant with an open heart and mind. Then, begin your own practice following these steps. Minute two: Centering your body, reflect on this wonder question: hmmm, I wonder how my use of plastic serves me? Hmm, I wonder how my use of plastic serves others? Minute three: Allow answers to arise. Return to centering, reflect on this wonder question: hmmm, I wonder how my use of plastic harms me? Hmm, I wonder how my use of plastic harms others? Minute four: Allow answers to arise. What sensations (movement, pressure, temperature) arise in your body offering new information about the use of plastic? Allow new insights to arise. Minute five: Reflect on this wonder question: hmmm, I wonder what new behavior around plastic would better serve others, the world and me. Complete your practice by integrating your new insights and committing to a new relationship with plastic. PURPOSE: To strengthen our physical body balance (gross realm), and to strengthen our energetic response balance (subtle realm). PREPARATION: Make sure balance on two feet is solid! If not, practice here. 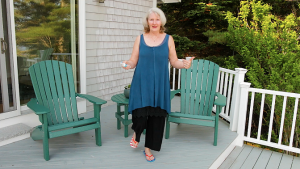 Minute one: Locate your balance on two feet. If you are secure, raise your right leg. Intend to balance for up to two minutes on your left leg. Minute two: For the next two minutes, balance on your left leg. Minute three: Balance. Be with the new sensations in your balancing leg. Minute four: Switch to your other leg. Raise your left leg and balance on your right for two minutes. Minute five: Balance. Be with the new sensations in your balancing leg. Complete your practice by noticing when you have both feet on the ground how stable and centered you feel. PURPOSE: To practice and gain mastery of PLAY in the flow of presencing, connect and play. PREPARATION: Gain clarity about your motivation to engage this practice. Why does mastering Play (Presence/Connect/Play) matter to you? Minute one: Presence your body and mind with a body scan. Minute two: Connect to the intimacy of this moment. Minute three: Move directly from connection to playing with the energy and vitality of this moment without expectation of something happening. Allow spontaneous action to arise with curiosity. Minute four: Be in this moment and the next by giving energy with an open heart, spacious belly and bright mind. What lights you up? What makes you smile? 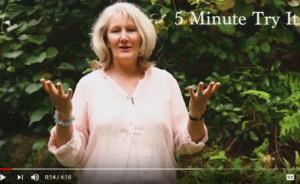 Minute five: Stay awake to what matters deeply to you as you stay present, connect deeply and play with a fresh response. Complete your practice by recognizing the essence of play is how we engage life – with openness, light-heartedness, meaning and energy. Presence, connect and play is an essential practice for current events and for our ability to navigate them well. PURPOSE: To practice and gain mastery of connection in the flow of presencing, connect and play. Connection is the immediacy of attention. PREPARATION: Now. This is it! Minute one: Begin with presencing for as long as you feel. Minute two: Connect with what is arising right now. Give attention without judgment, evaluation, or desire. Complete your practice by recognizing connection is this moment of giving attention. Simple and profound. 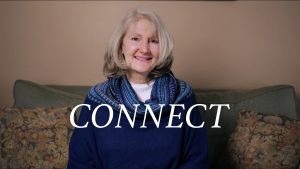 PURPOSE: Continuing the flow of Presence Connect Play from Kathlyn Hendricks, we dive deeper into Presence. Presence is where we live life when we are fully engaged. Full engagement allows optimal joy, love and meaning to flourish. PREPARATION: Remember the purpose of Presence Connect Play offered from last month. Bring your “hands practice” to this month’s offering. Recognize that there is no “end point” to presencing; presence is an always and forever practice. Presence allows us to authentically connect. Minute one: Locate your body and begin with a body scan from the top of your head to the bottom of your feet. Imagine a light breeze moving through your body – gently and completely. Once your scan reaches your soles, ground deeply in the earth visualizing roots shooting to the center of the earth. Minute two: Bring the scan back up your body with the same gentle breeze to the top of your head. Intensify the felt sense of your body-skin and the interior of your body. Become familiar with your body envelope. Minute three: Using your body-skin as the boundary, notice all sensations, in particular, pressure, temperature and movement. What lights up in your body? Minute four: Give attention to the sensations you notice, be present with what is happening. This practice strengthens body awareness and the capacity to Presence, to “know” what sensations are communicating to us. Minute five: Float this question: What is my body offering me right now through sensations as I presence what is? Complete your practice by honoring presence as an essential practice to be here, embodied, with what is – as presence. 5-Minute Try It: Presence. Connect. Play. PURPOSE: Life begins with presence, the ability to be completely here with whatever is arising. 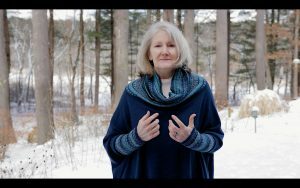 This month we begin a series of practices that align with a vibrant way of orienting to life developed by Kathlyn Hendricks, Ph.D. We experience a taste of Presence. Connect. Play.- with our hands to become familiar with the practice. In the following weeks, we will unpack each aspect of this practice and bring it all together at the end. PREPARATION: Get willing to open and move through the world in a more joyful engaging way. Minute one: Bring your non-dominant hand in front of you and begin to saturate it with attention. Notice the sensations that arise in your hand as you give curious attention to your hand. Minute two: Engage your other hand by bringing it up closer to your first hand. Compare and contrast the felt sense of each hand. Allow your hands to move from presence to connecting. Minute three: Notice how the feelings in your hands shift as they connect and relate to each other. Continue to connect your hands until there is a natural spontaneous arising to play. Minute four: Allow your hands to move together and “play”. See what arises in spontaneous movement and connection. Notice how your attention retains presence as connection and play continue to spiral deeper. 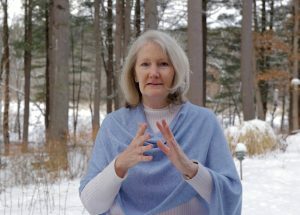 Minute five: Deepen your practice using your hands with presencing, connecting and playing so that you retain the basic flow of this natural practice. 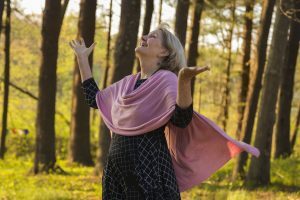 Complete your practice by presencing your hands, connecting your hands, and committing to engage in this activity for a month to build a basic muscle of presencing, connecting and playing. PURPOSE: Sometimes we benefit from a simple clean up and fill up. Clean up is a way of letting go – of whatever is ready to leave your experience (e.g. literal dirt, or a feeling, thought, or belief). Fill up is a way of receiving whatever nourishes you now and going forward (body oil, vibrant energy, warmth, positivity, love). PREPARATION: This practice can be experienced anywhere, as long as you have imagination. For ease, try the shower for the benefit of direct water flow supporting the practice. So to prepare, get naked! Minute one: Allow water to wash over your head and feel the sensation of water running all over your body. Appreciate the flow of water. Minute two: Imagine an opening at the top of your head with a channel moving down all the way through your body into the floor. Allow water to cleanse you from the top of your head to the toes on your feet. Feel the flow of clearing and cleansing. Minute three: When complete, rotate your head clockwise and counterclockwise to signal the cleaning is finished. Prepare for filling up. Minute four: Again, imagine that the water flow is directed to the opening and channel in your body. Feel and experience light, joy… patience… (whatever you want to receive) filling up your body beginning at your feet and completing at the top of your head. Minute five: When you feel sufficient, again rotate your head clockwise and counterclockwise to signal the filling up is complete. Complete your practice by luxuriating in your nourishment of cleaning up and filling up. Allow this practice to support you and recognize the support from water, a precious element from nature.